Another year comes to a close at Thirdwigg.com. Thanks to those of you who visit, read, comment, and build. In many ways 2015 was a frustrating year for me as I was finishing or attempting to finish many projects that were stalled, or ones in which I had lost interest. In retrospect, I should have cut ties, and moved on to something I would have enjoyed building more. Because of this and other responsibilities, my completed MOCs were down a little for this year. As a recap, I completed the Cadillac ATS, Windrower, CAT 586C, OCTAN Air Racer, MD600N, 2045 Mercedes Benz Athane, Audi allroad, and T-55. To reflect on this year, some things come to mind. First, having a dedicated building space is a plus and a minus. It’s nice to be able to have a functional space to keep things organized and separate from the other parts of my life. But it also keeps me away from other good things in my life, so I do not find myself casually building while something else is going on. Also, I can hide my mess in the room which contributes to a lack of focus on projects. This bogs me down. Second, I am very proud of some of the builds I completed this year. The MD600N and the Cadillac ATS were projects that were outside of my comfort zone, and the time spent completing them reflected this. Though this reminded me that as building time become more limited, I should be careful to limit my difficult projects. Third, I think I have finally found a good, consistent, and repeatable photography system for my MOCs. While my pictures are not quite 100% perfect, they are 90% perfect 100% of the time now. This is a great improvement, and allows me to take photographs more often regardless of light or weather (particularly instructions). Finally, I need to stop making supercars. I get excited by planning for them, but I do not find building the exteriors very exciting. Because of this supercar projects drag on for far too long. For 2016 here are my goals. Work on no more 3 WIPs projects at a time. More can be planned, but not built. Do what I can to get to Brickworld 2016. Finish the Ferrari 333 SP. Maybe another tank, or a Honda 2×4. Neat. Let everything else flow as it comes up. With thirdwiggville now filled with four wiggs, it’s about time for me to acknowledge my temporal limitations. I will update The Queue as things come up. Welcome back to the second annual Thirdwiggy Awards. Since I have my own website, I get to pick my favorite MOCs of the year. So, here they are. As with every list, the challenge is not in what to include, but what to leave out. As a reminder, this is how the Board of Trustees at Thirdwigg.com evaluate MOCs throughout the year. Was the MOC something creative? Basically, was it something different than a red supercar, or a yellow truck/machine? Did it contribute a new build technique to the community? Did we learn how to transmit movement in a new and unique way? Was it something I found myself returning to frequently? I build at lot, and others inspire my builds. Did I see something this year that I incorporated right away? Was is visually appeasing? It takes work to make a Technic MOC look good. Granted, this is subjective, but I think my eyes are generally consistent with the eyes of others. Let’s start the year off with a biggie. I wondered how many people saw this based on the flickr views, but I love this. The size, the function of the crane, and all the sticks on the back. Plus, I know how hard it is to build with all that dark green. Plus a good brick exterior is great. Great job. Nico71 needs no introduction. One of the things I like about him is the simple execution of complex functions. Because of his work, I now know how a loom works. The TechLug LMP contest this year had some great designs, but what stood out for me about Nico71’s design is the simplicity of the suspension. Designing a simple and functioning pushrod suspension is no easy task, and this LMP1 shows a great solution for the problem. 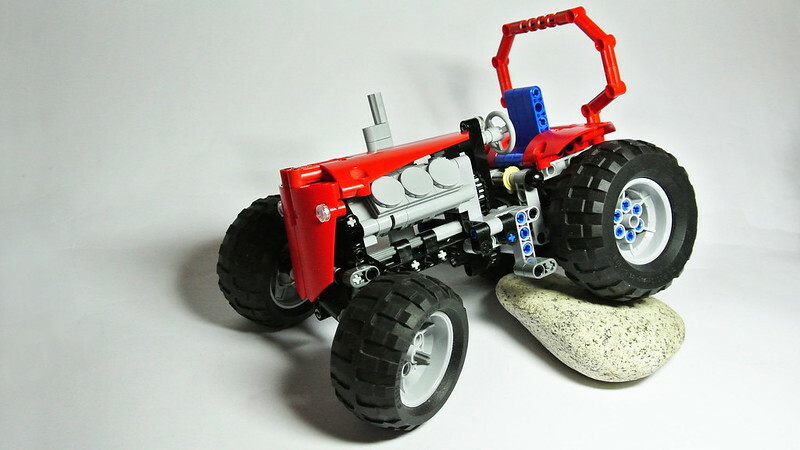 The opening doors and panels, and those great wheel fenders set this MOC apart. Nico71, you have made some great cars. We look forward to more. This MOC received a lot of praise when it was released, and for good reason. It’s large, it functions well, has some great features, and the exterior is well polished. I loved the inclusion of the water tanks, and it has just the right amount of stickers. I have been impressed with the couple of builds Lucio Switch has made in a very short amount of time. Hopefully that will not end anytime soon. As usual, the French Techlug group, produces some great MOCs over the course of the year. They do a great job organizing some great contests, and 2015 was no exception. On the heals of the 42039 24 Hour Car, the LMP contest was a great idea. The contest produced some great cars. This one I liked because the lines were creative due to the way the panels interacted, and the door hinge was great. It was great to learn about BJ51 from this MOC. Great job. Without saying too much about the Rebrick 2045 Contest that makes me sound like a sore loser, there were some winning designs that were… simple. The winning Mercedes Phoenix was beautiful, but it didn’t make me think about the future in a new way and, I think, it only had one function. A contest like this should tell me how we will do things (transportation in this context) differently. The E-Core was beautiful, and used Technic elements well, and it got me excited about trucks of the future. I loved door and stair system. I loved the modular design with the different drivetrains for different loads. And each load would require a different addition; power, steering, etc. I could see this being helpful in a future where loads are more diverse, cities are more dense, and safety is paramount. I’m a sucker for helicopters, garbage trucks, and fellers. This MOC was just what I needed to see as I was slogging through my MD 600N. The styling on the bodywork was well planned, and functioned well. I appreciated the focus on the bodywork, and appreciated the builders inclusion of only a collective. I look forward to seeing more helicopters next year. There are big MOCs, and then there is this. The size of this DAF is mind-blowing. After building the Spitfire and the Typhoon, I know the challenges of building MOCs this large. You have plan a lot from the begining, and you are constantly rebuilding to make the MOC support itself. Take a look at the video. It’s so slow, but so huge. I couldn’t help thinking, how many 8110 Unimogs were harmed during this build. Marat is one of the few builders I have actually met. He does not publish much, but the MOCs he does publish are top notch. 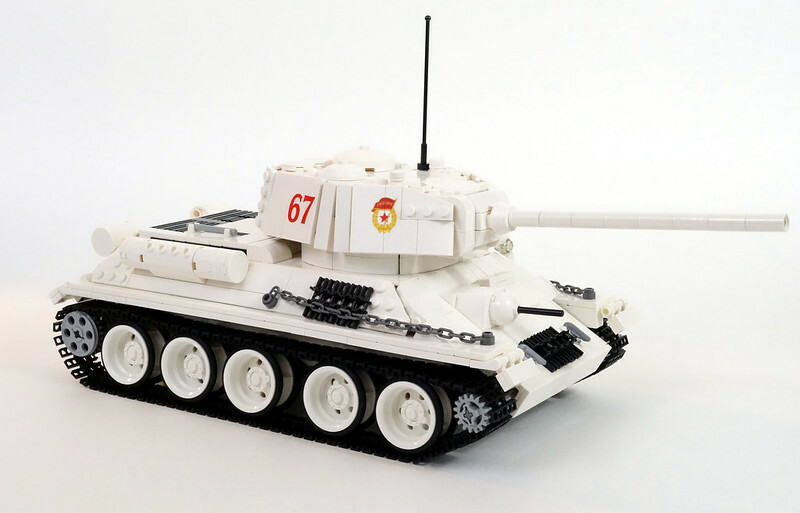 Like the next tank, the T34-85 packed so many functions into a small and perfect body. The shaping of the turret, the turret ring, and the seamless meeting of many wedge plates are some of the details I love. All the needed functions of a Technic tank are there, and everything works great. I highlighted Tommy Styrvoky in last year’s list as someone to watch, and oh boy did he deliver in 2015. Tommy has tank bodywork in LEGO figured out. He recreates the shapes of many tanks well. The Sherman continued this trend, but added some complex mechanical functions. The mine flail on the front is easily identified, but the difficulty of packaging normal functions like drive and turret rotation, and complex functions like the gun elevation and the gearbox are less apparent. Also, explore how he created the suspension using internal pulley wheels; it’s stupendous. Great job Tommy, and we look forward to more builds. Maybe one in something other than Light Bluish Grey? I kept coming back to this build this year. It was another entry in a TechLug contest. The design is simple, colorful, and has a playful look that I long for in many MOCs that is often present in TLG sets. The functions of the lifting mechanism, rotor, and container grabber are well executed, and the integration of the motor is great. Plus it’s orange. How great is that? For the first couple of months after this car was published, I ignored it as another supercar. I was not very interested as I found the body stance a little too forward. I enjoy cars that have rearward stance (long hood/bonnet, short deck), which is why sedans works better for my eyes. Anyway. What turned me on to this car was discovered while reading a review of the MOC on Rebrickable.com. It was here I learned how the transmission worked. Getting a realistic moving 6 speed manual transmission in LEGO is hard. It took me 2 years to finalize the design in my ATS. The Predator linkage is smooth and simple, yet accomplishes the task. I am not sure why it has taken so long for someone to mount a transmission vertically in a car. The originality of this simple solution is excellent. Creative solutions to complex mechanics are great to see. Seriously, follow František Hajdekr on flickr. He is talented and builds fast. If you need lots of small ideas, go check out some of his solutions. I struggled with which creation of his to add (his Motorcycle gets an Honorable Mention; look at that engine), as so many builds are great. I had to pick one. I loved this little tractor. With a small working engine, steering, and pendular suspension, the MOC ticks all the right boxes for me. The playful aesthetics and a build size right up my alley, I am happy to include this on the list this year. Feller Bunchers are my favorite machines. Something about the mechanical coordination of driving up to a tree, cutting it, lifting it, and then moving it to wherever it needs to go is so exciting for me. The size of this MOC is impressive, but the mechanics are what get it on the list. The tilt-able deck from the four way stand is complex, and it was fun watching it come together one Eurobricks. The cutting head is clean, and well executed. And it’s green. People, make more fellers. I loved these three cute little MOCs. They function well, do not have anything extra, and they have only what is necessary for this scale. More people need to build like this. 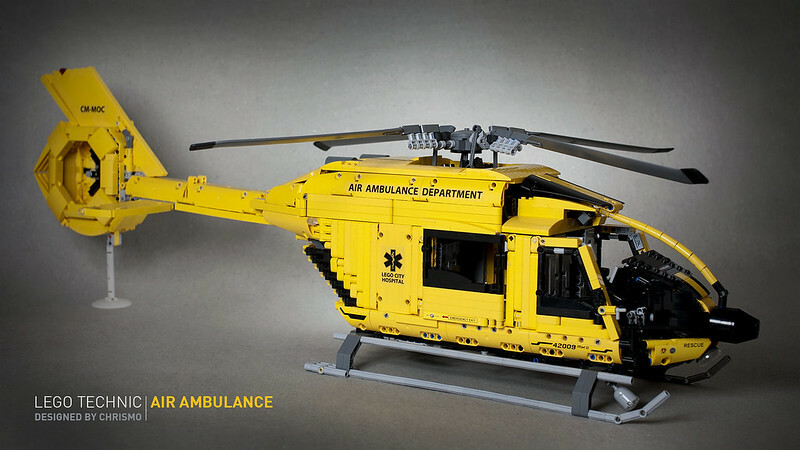 I’m looking forward to the Eurobricks Technic Challenge 9 contest, to see if it produces similar MOCs. I love the little red one with the small bed. I challenge you to build something like this. Forklifts are common and simple machines, and yet, they are infrequently done well in LEGO. The fork part is hard, and to complete a working multiple stage lift mechanism takes a lot of planning and trial and error. 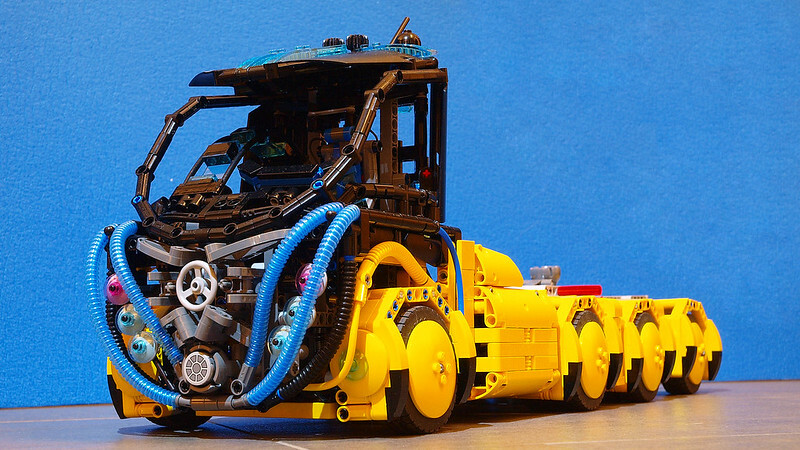 TheItalianBrick recreation of a Hyster 32-12 is beautiful. 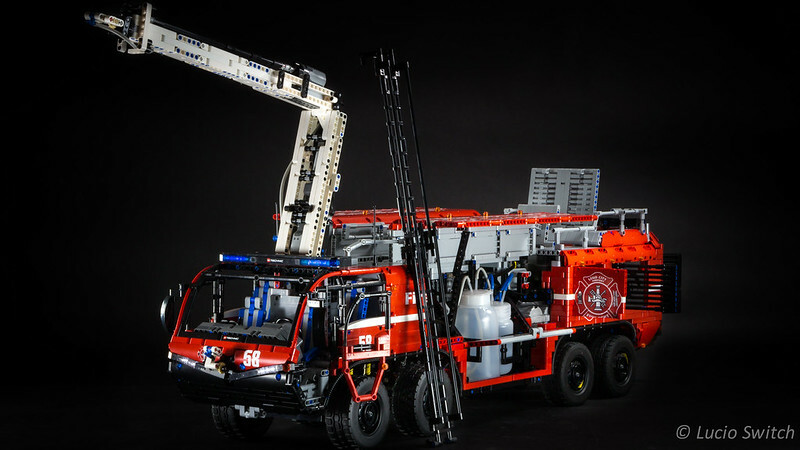 The MOC is complex, huge, and finished to the tiniest of details (notice how those fork-width motor wires are routed on the right of the lift boom). The rear fenders are perfect. The running boards are so simple it hurts my head. The Unimog tires look great in this MOC. Congratulations, TheItalianBrick, you win the 2015 Thirdwiggy Award.